The craft came to a stop in a cloud of dust. 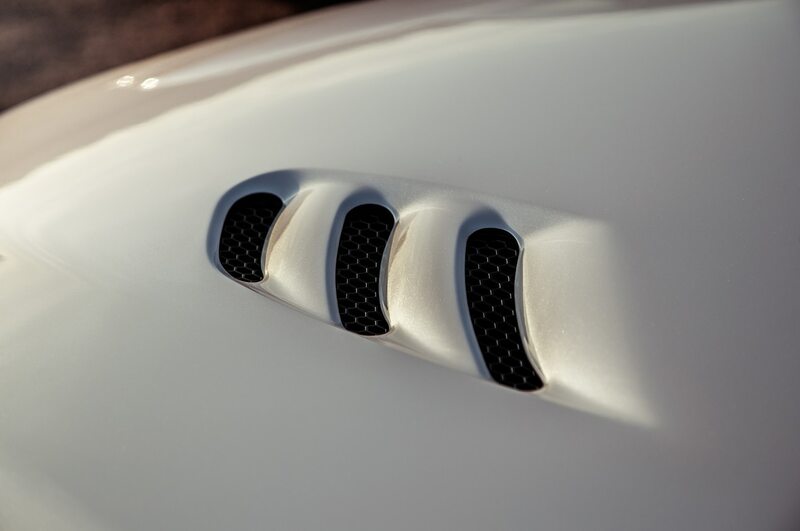 A slender figure emerged from inside the swoopy, sleek sheetmetal—loose skin, bulbous head, humanoid but with a hint of something extra—and a swarm of scientists descended, needing feedback. Needing data. Needing to know: Have we finally broken through? I have always been fascinated with Area 51. Stories of secret test flights, of government scientists collaborating with alien pilots to push the limits of what we believed possible, hooked my childhood mind. And seeing Capt. Steven Hiller pilot his F/A-18 through the Grand Canyon, flying saucer in hot pursuit, only solidified my intrigue (Independence Day’s fictional nature notwithstanding). 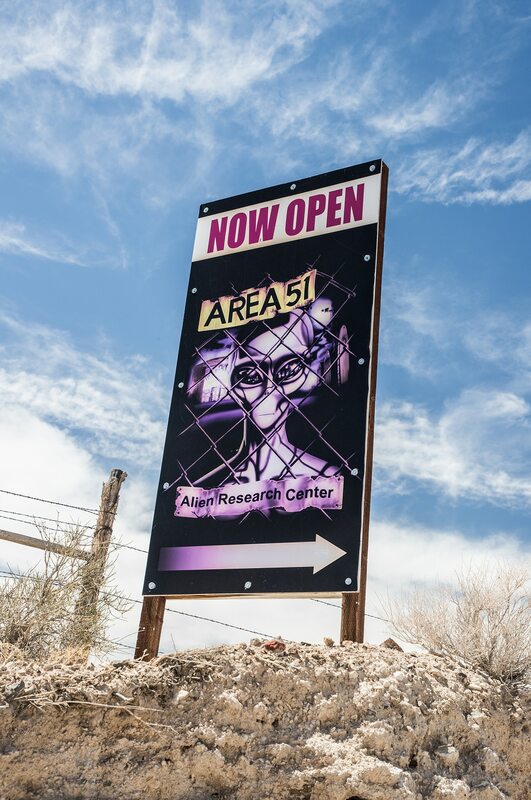 Was that top-secret area in southwest Nevada really the place where the government had hidden the Roswell aircraft? Had we reverse-engineered spacecraft not of this earth, perhaps with alien aid? Or were the feds telling the truth when they said the facility was merely the development site for military jets such as the U-2, SR-71, and F-117 Nighthawk—jets that suspiciously flew higher, faster, and sneakier than any before? Like those military jets—or flying saucers—these five ridiculously high-performance SUVs we are piloting refuse to conform to classical ideas of appearance and capability. Originally created for rock-crawling or helping out around the estate, sport-utility vehicles have become America’s favorite mundane family haulers. 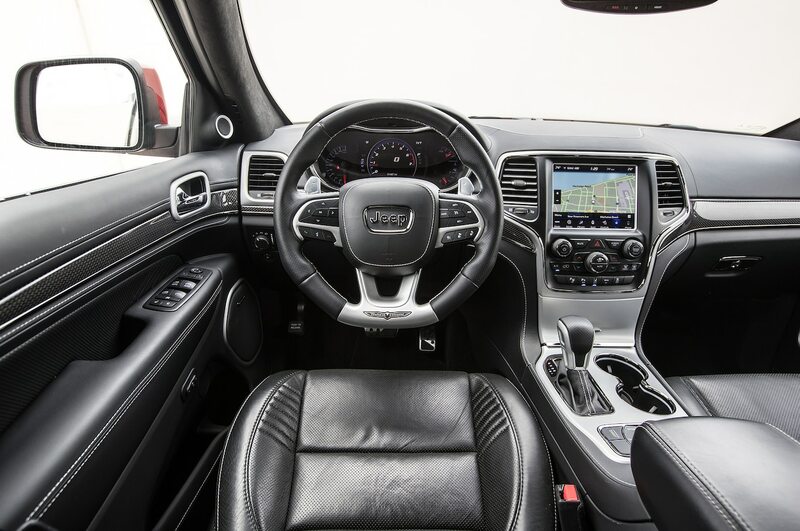 But somehow, in a recent unexplainable technological leap, SUVs have also evolved into supercars, with overboosted engines stuffed between their fenders and suspensions cranked down for sports car levels of performance. This is higher, faster, sneakier space-alien stuff. Which is how our pack of otherworldly vehicles is screaming at post-apocalyptic velocities across Nevada’s Extraterrestrial Highway. What better place to find answers on the hottest transport advancements than America’s most secret environs? 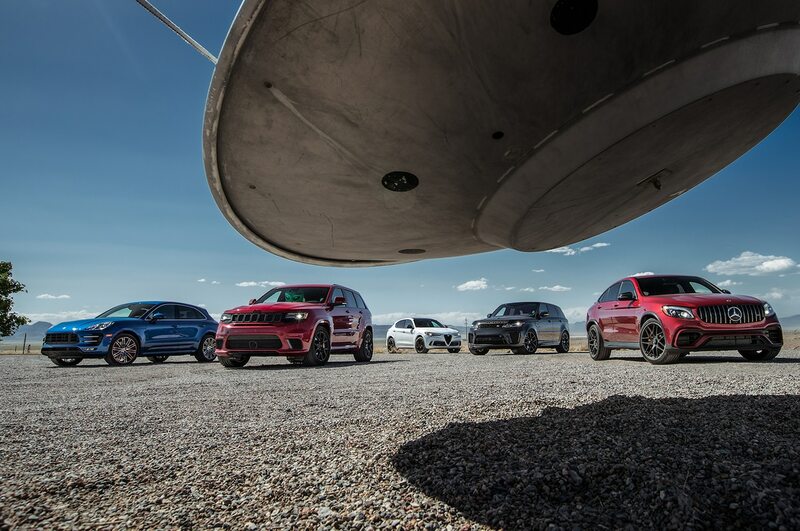 So we rip a hole through the desert air, alien experimentation on our minds, in a 2,730-hp convoy of performance SUVs built by manufacturers that have thrown out their rulebooks. The 503-hp 2018 Mercedes-AMG GLC 63 S 4Matic+ Coupe I’m piloting is a challenge to the automotive status quo. 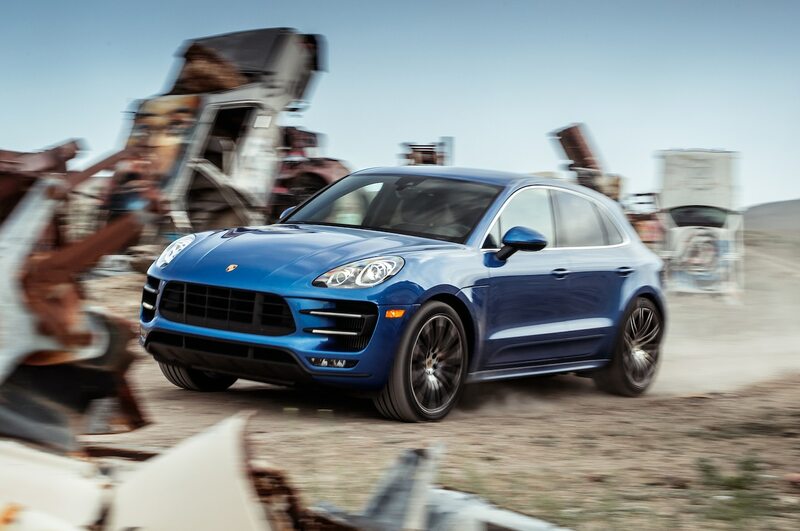 SUVs don’t need to be big and slow; sports cars don’t have to be light, low, and lean. Like it or not, SUVs are where the auto industry is going. With its twin-turbo V-8 making 516 lb-ft of torque mated to a nine-speed auto with all-wheel drive, I can’t say I mind this form of transport. 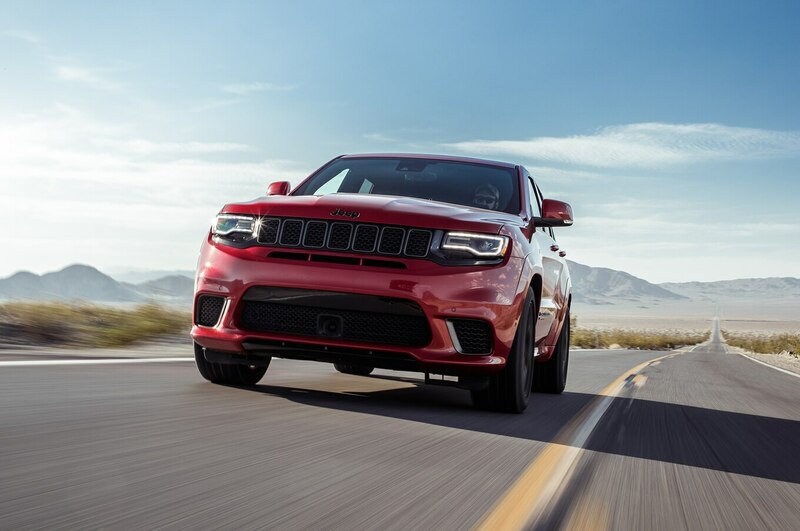 Coming from brands traditionally known for their off-road prowess, the 2018 Jeep Grand Cherokee Trackhawk and 2018 Land Rover Range Rover Sport SVR both turn their backs on knobby tires and mud slinging in favor of a pair of supercharged V-8s. 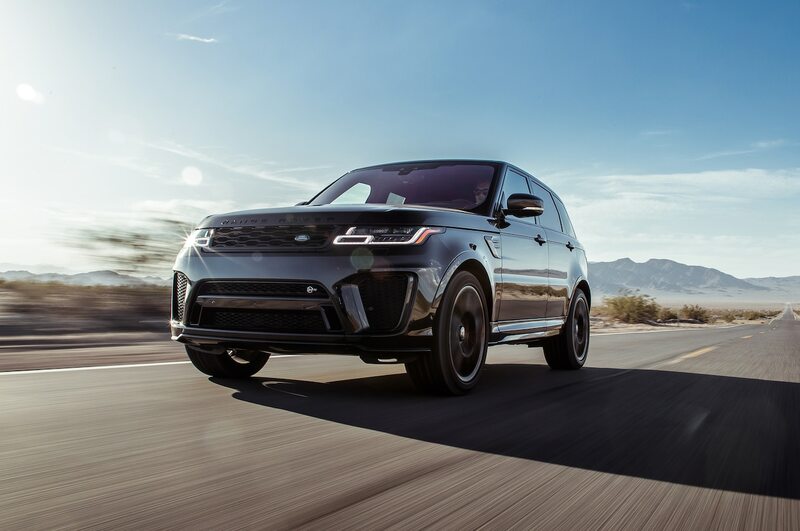 The Rover’s new-for-2018 5.0-liter unit makes 575 hp and 516 lb-ft of twist and is paired with an eight-speed automatic and a full-time four-wheel-drive system—its vestigial link to its past. 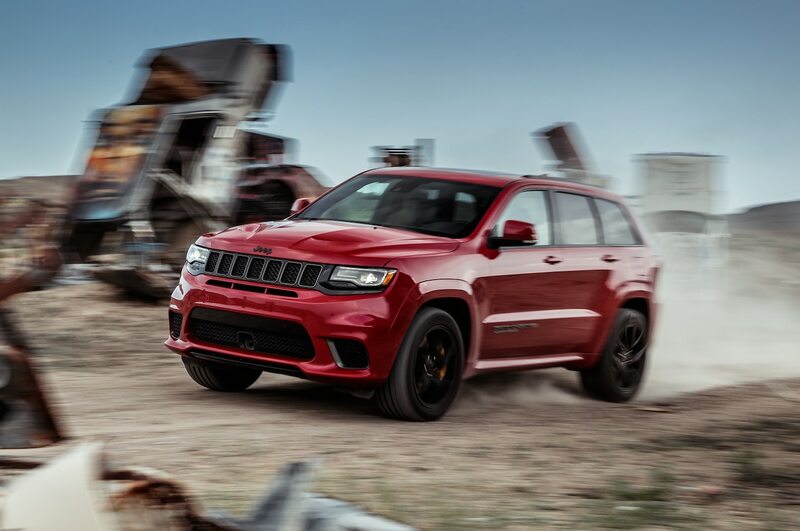 The Jeep, in a nod to the nuclear wasteland that is the Nevada Test Site surrounding Area 51, goes all in with its 6.2-liter Hellcat V-8, which puts out an absurd 707 hp and 645 lb-ft of torque. 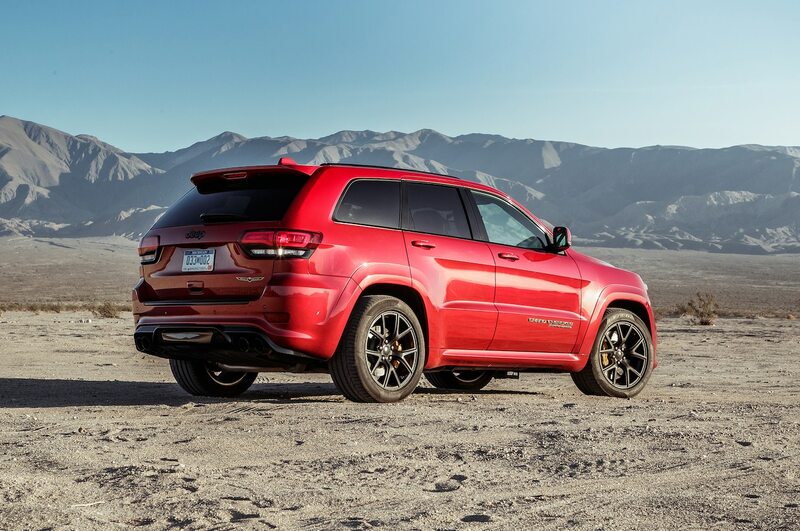 The Grand Cherokee’s engine is abetted by an eight-speed automatic and an all-wheel-drive system. 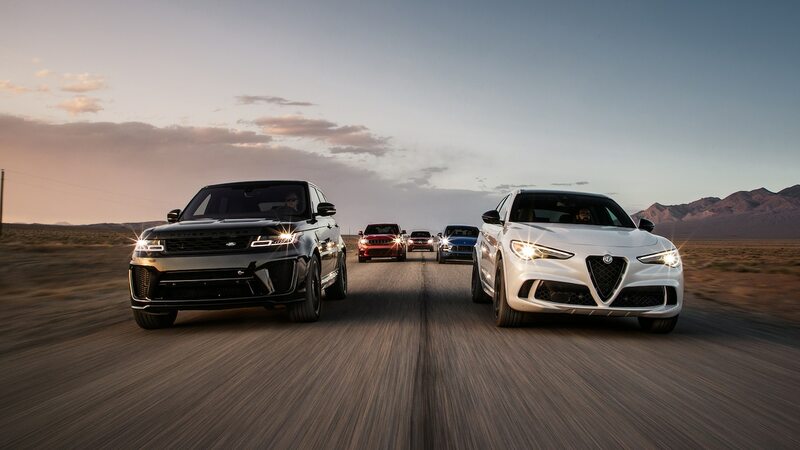 Meanwhile, the 2018 Alfa Romeo Stelvio Q4 Quadrifoglio and 2017 Porsche Macan Turbo with Performance package are a weird, roundabout return to the roots of the two storied racing brands. 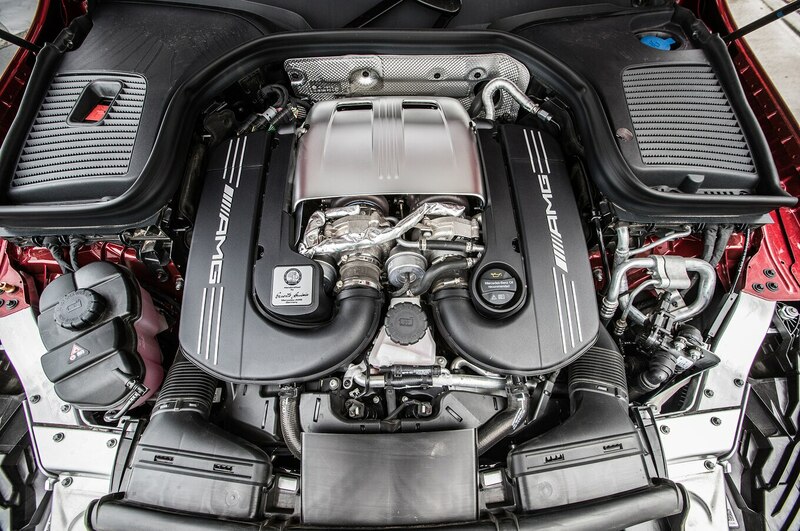 The Stelvio packs a Ferrari-derived 505-hp 2.9-liter twin-turbo V-6 under its hood, and it’s backed by an eight-speed automatic and all-wheel drive. 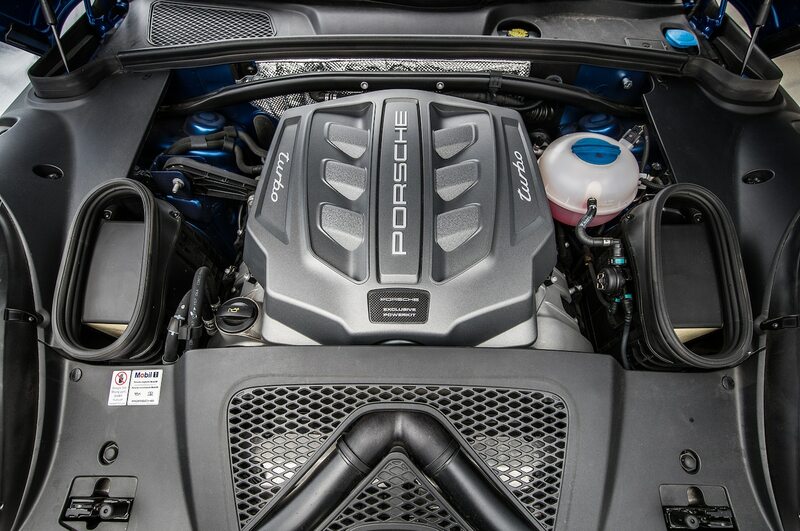 The Macan rides on an Audi-developed platform, but its 3.6-liter twin-turbo V-6 is all Porsche. 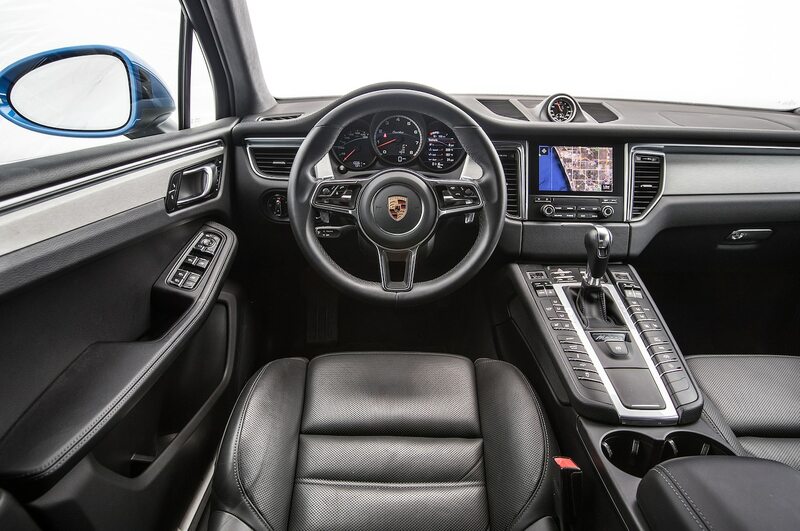 It packs 440 hp and 442 lb-ft of torque, and it’s backed by Porsche’s famed PDK seven-speed twin-clutch gearbox and torque-vectoring all-wheel drive. The stakes here are high, and I’m really pondering the idea of a 440-hp Porsche being the lowest-output beast of this bunch. 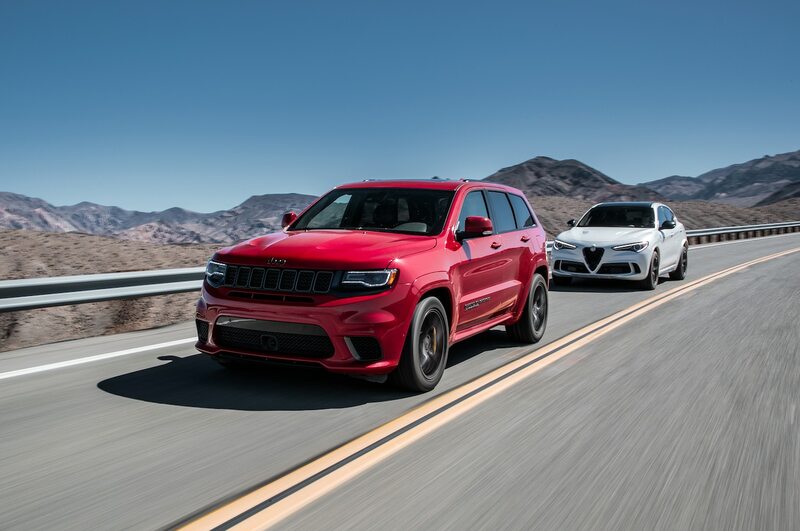 The winner of this performance SUV comparison test will have the honor of being the first SUV to compete in our annual Best Driver’s Car competition next month. 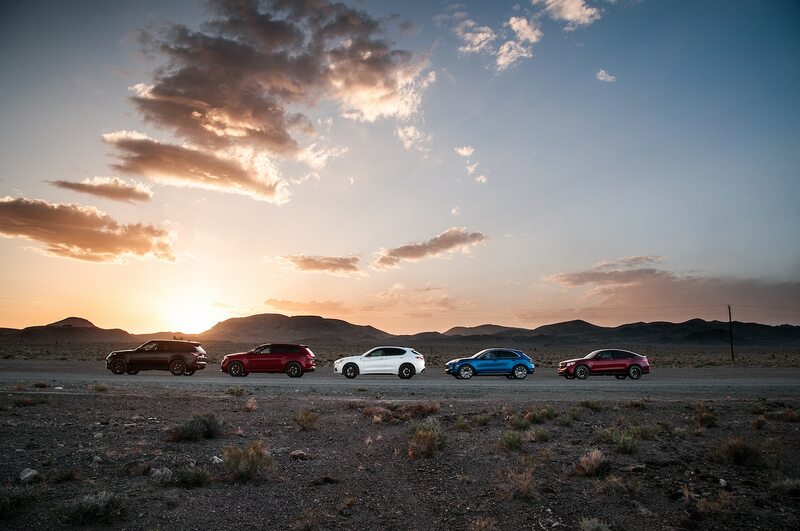 As such, the rules are simple: The winner needs to be the most engaging, exciting, fun-to-drive super SUV in our quintet—the SUV that’s most likely to upset the world order. The scenery a day earlier couldn’t be more different. 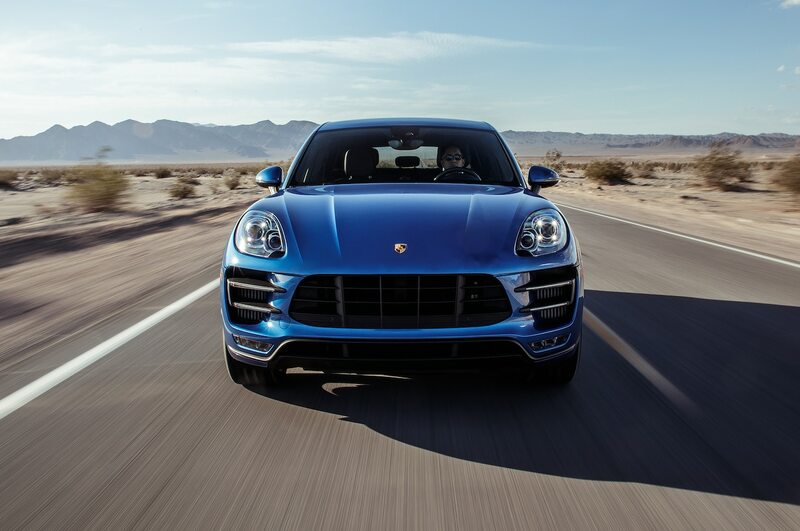 A twin-turbo V-6 growls in front of me as the sapphire blue Macan slices through soupy coastal clouds and mist as we climb the Angeles Crest Highway to meet up with the rest of the group. It’s been a while since I’ve driven a Macan; this one offers an extra 40 hp, larger front brakes, and a few other go-fast options. It feels the same as the Turbo without the Performance package, but Angeles Crest will be the place to prove it. The highway twists and turns 66 miles (106 km) up and over the San Gabriel Mountains as it links the L.A. basin to the Mojave Desert and beyond. It’s the perfect nearby-substitute for the Best Driver’s Car’s State Route 198 hill climb. But there’s something off about the Porsche. 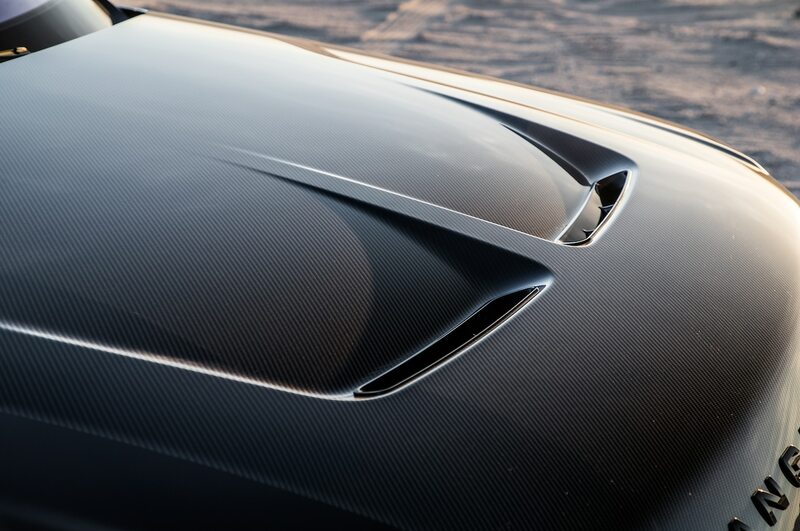 It’s not in the way it drives, but in the way it makes you feel—or not feel, rather. 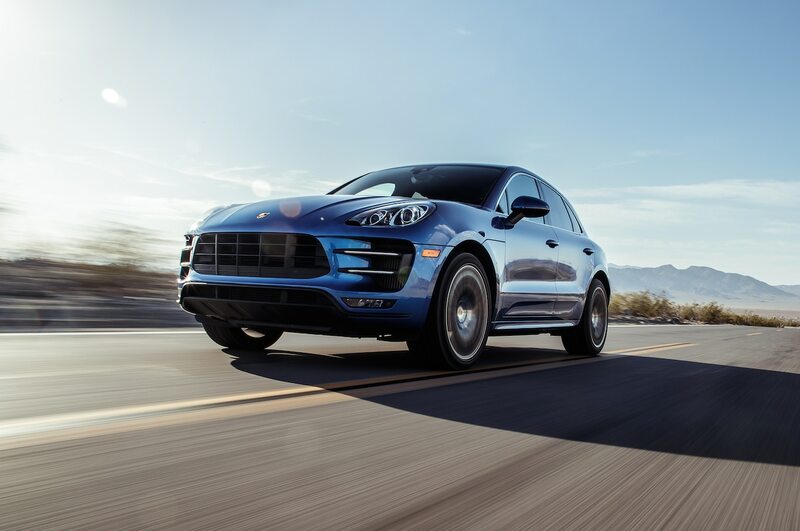 There’s a sort of numbness to the Macan Turbo that’s tough to identify—the Novocain-numb steering is part of the issue, but there’s more to it. Although this crossover is supremely capable, I found myself daydreaming about bills to be paid and errands to run. Nearly every other editor felt (or didn’t feel, as the case may be) the same detachment. 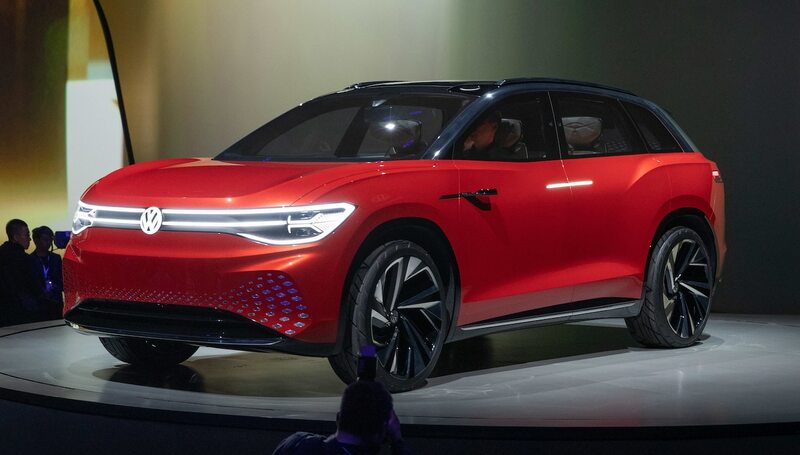 “There’s no doubt about its capability, but there’s just no emotion in it,” features editor Scott Evans said. Driving a good car up a good road is supposed to be an escape. 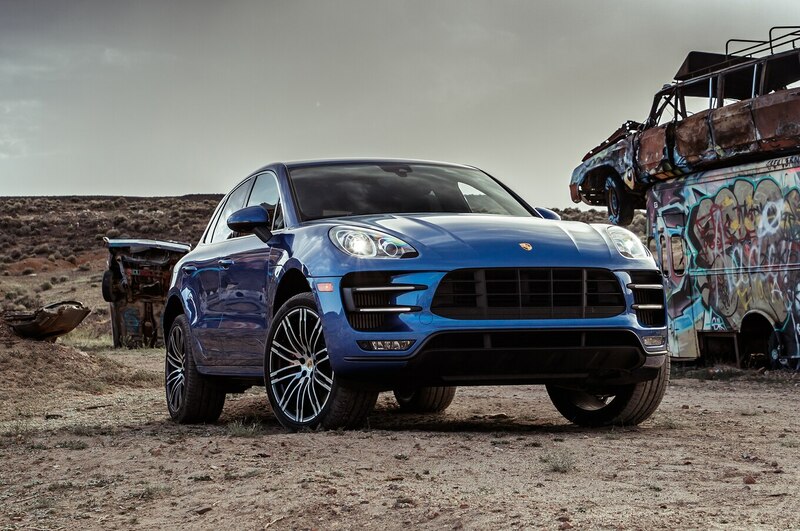 The Macan wasn’t acting like one. 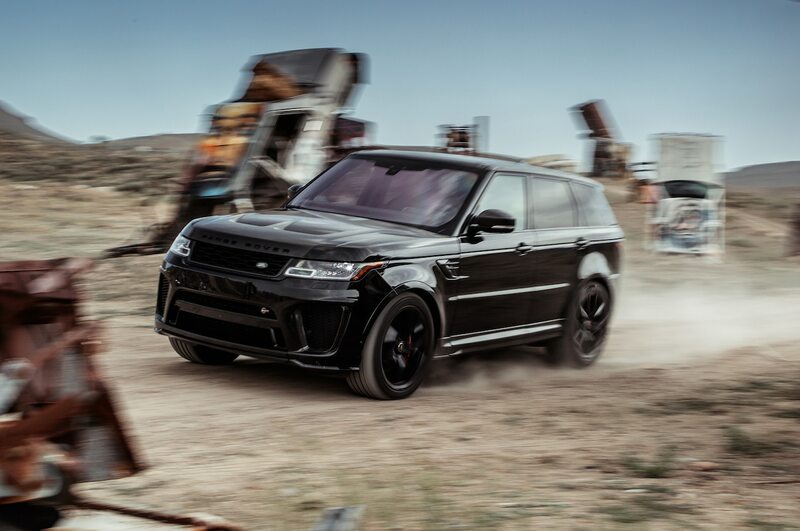 Seeking a shot of adrenaline, I swapped into the Darth Vader–black Range Rover Sport SVR for my next run. 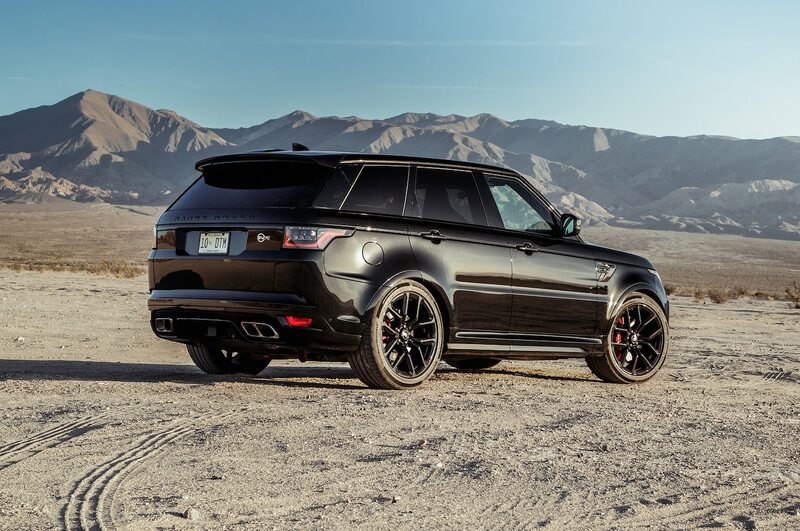 I have fond memories of the pre-refresh Rover Sport SVR. Although it’s short 25 horsepower compared to the new one, it was absolutely hilarious to drive—the only SUV as prone to swinging out its backside as it was to plowing through a bend. It took all of four corners to discover that the SVR’s manners have finally been tamed. I haven’t decided if that’s a good thing, but because you’re no longer fighting the Rover, you do get a chance to evaluate its prowess in other areas. 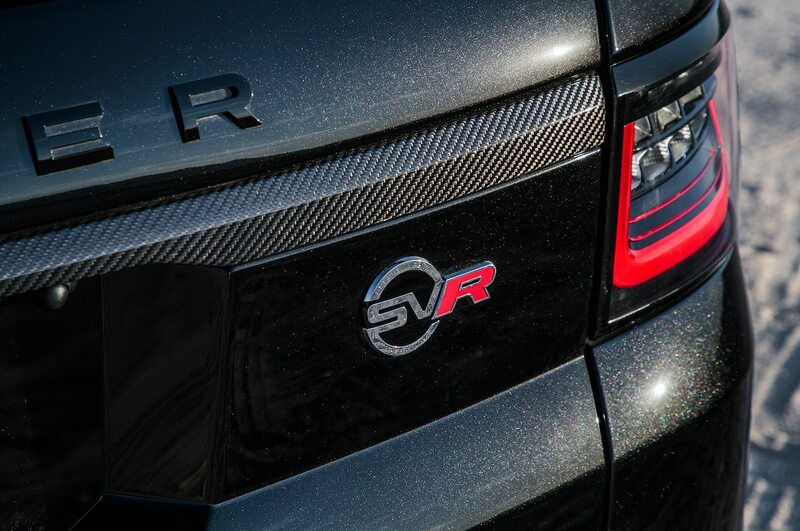 “Not nearly as ridiculously tail happy as the last SVR, this iteration does feel noticeably smoother,” Jonny said. 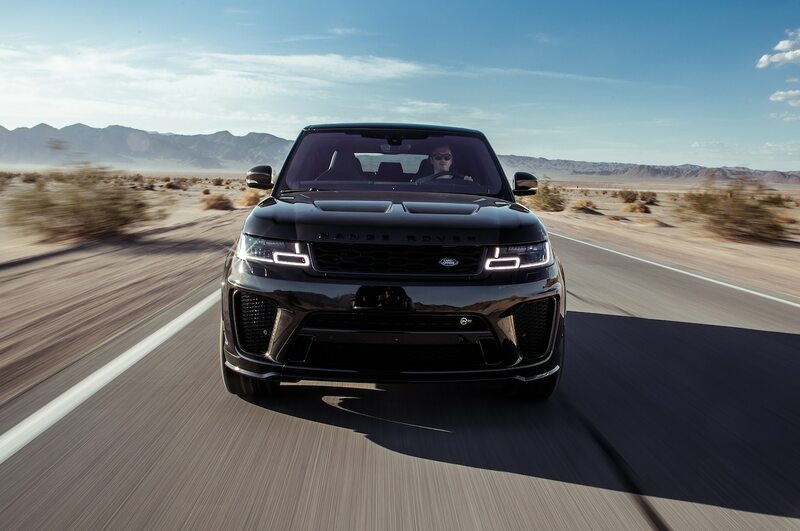 The Range Rover Sport’s steering rack has a surprising delicacy and lightness to it, given the Rover’s size, but its air suspension can’t keep up on a good road. “Its weight is noticeable on the twisties, where it leans quite a bit,” associate road test editor Erick Ayapana said. 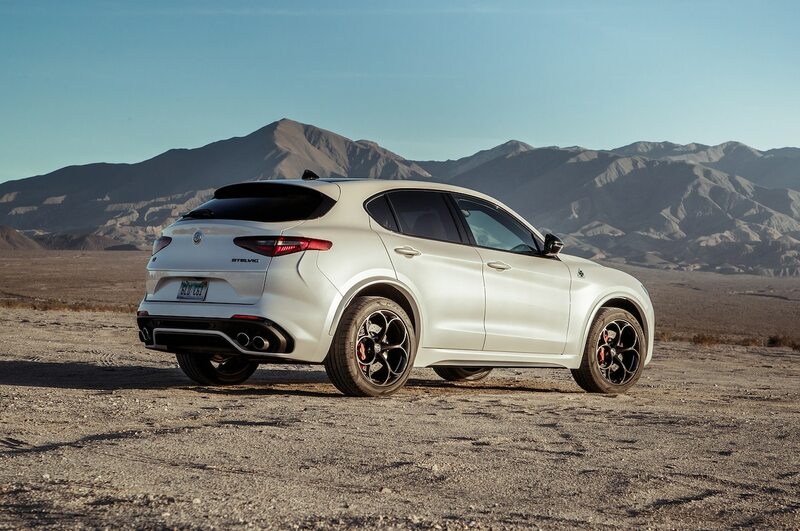 If you’re only looking to figuratively set your world on fire, the Alfa feels like it comes from a different galaxy than the Rover and Jeep. 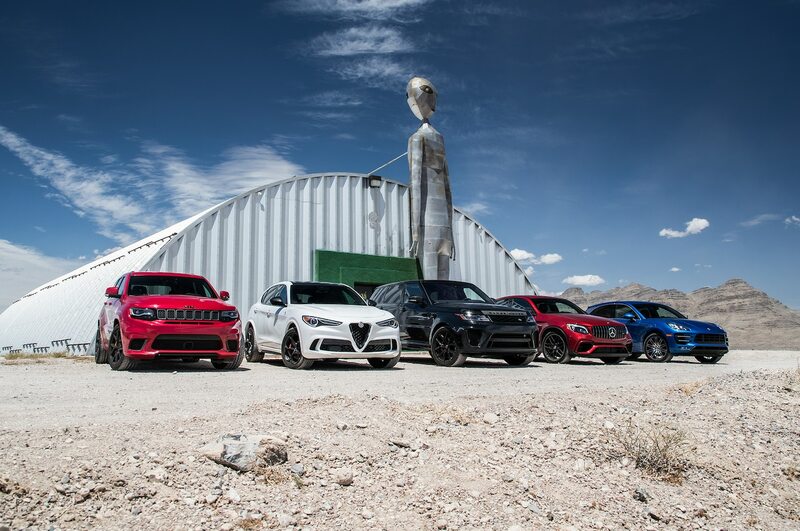 The Stelvio is a crossover only in that it looks like the rest of the SUVs assembled here. 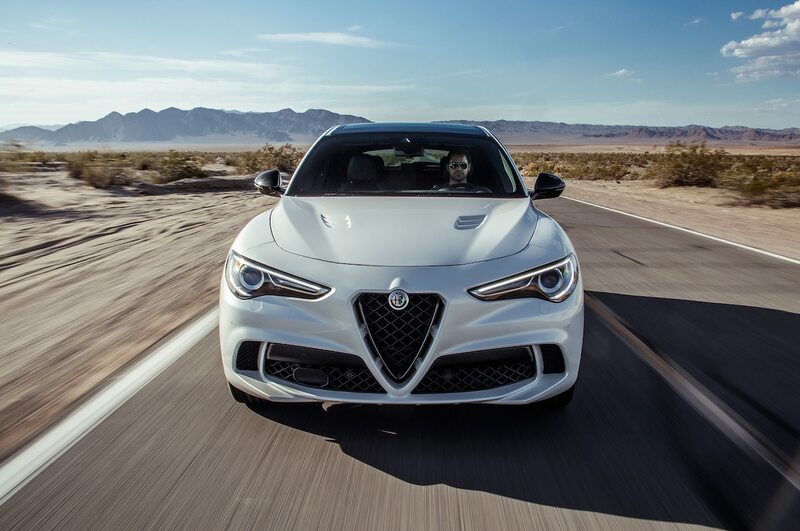 From behind the wheel it feels like its sedan stablemate, the Giulia Quadrifoglio, with an extra carbon-fiber halfshaft driving the front wheels. “The body control on this high-rider is incredible,” Scott said. Collin agreed, adding, “From the moment you take off, everything just feels right. 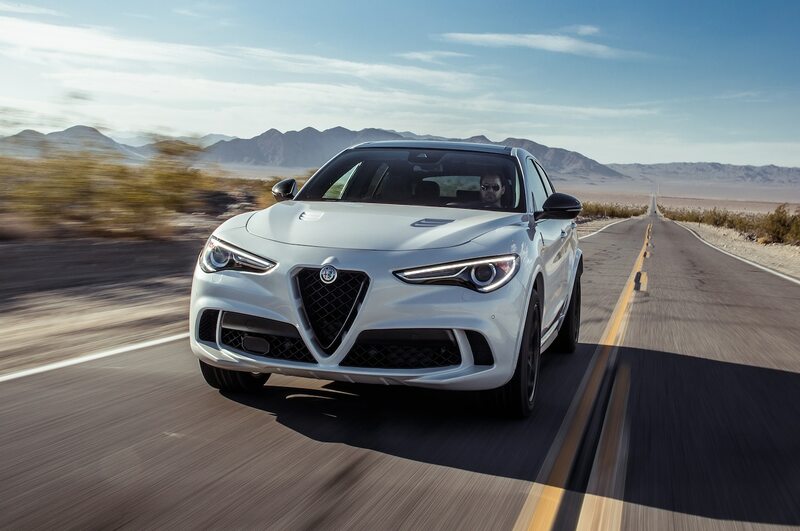 Thirty seconds in, I almost forgot I was in a crossover.” It might sound like hyperbole, but the Stelvio really manages to capture the engaging, dynamic feel of the Giulia sedan (warts and all), from its pure steering to its grabby, hard-to-modulate brake-by-wire system. 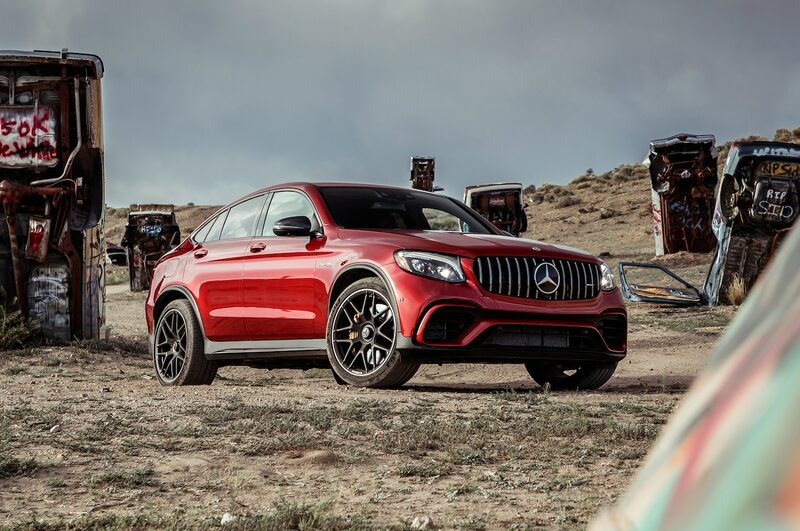 Stuck in both camps is the AMG GLC 63. 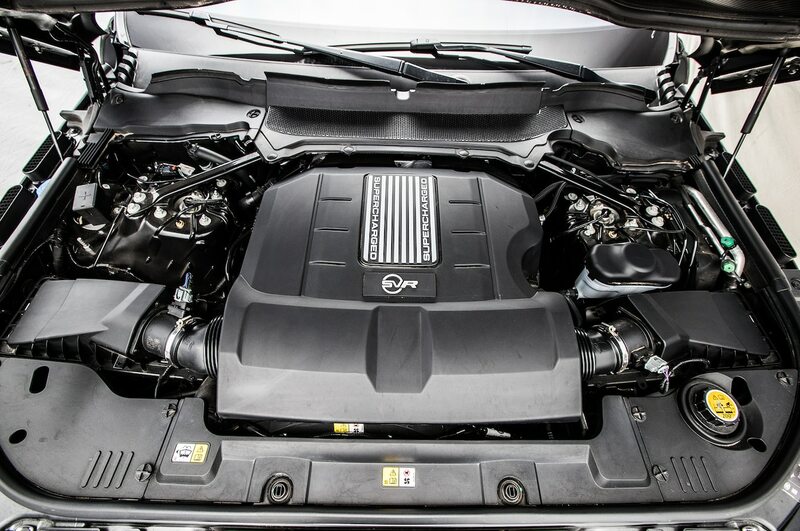 In some ways it bridges the gap between the Jeep/Range Rover camp and that of the Porsche/Alfa, offering up a V-8 for the former crowd and the European sensibilities of the latter. 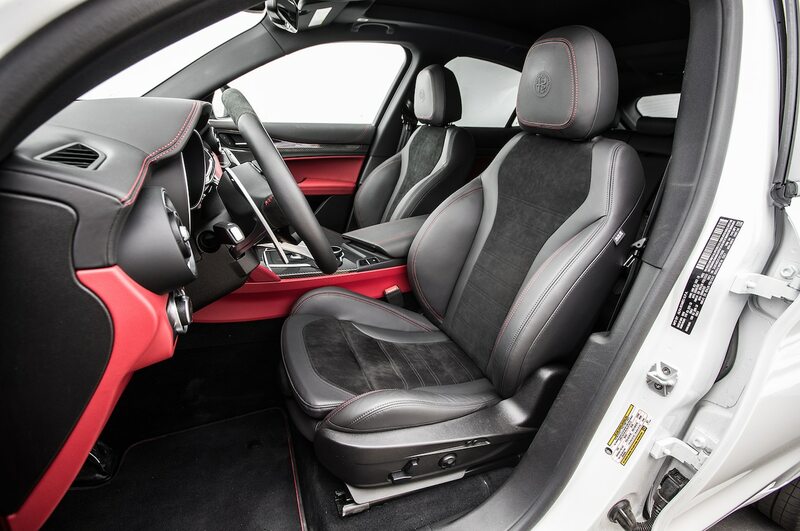 “It didn’t take long to feel confident behind the wheel of the AMG,” Erick said. 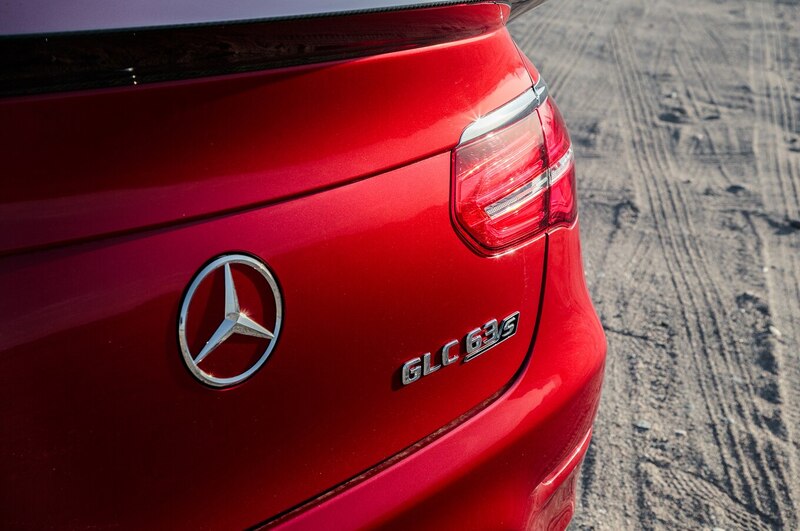 True to its new AMG badge, the GLC 63 begs to be pushed to its limit. Trouble is, you might not like what you find once you get there. “Steering just feels good: sharp, precise, perfectly weighted,” Jonny said. 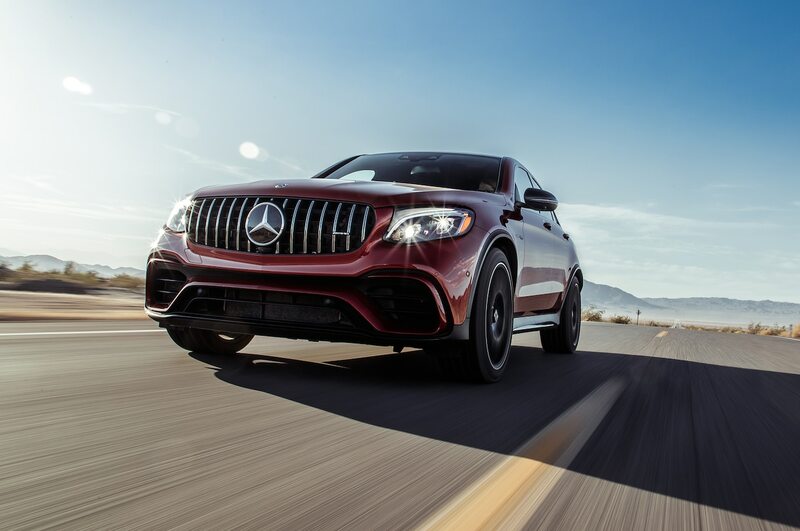 “But once you start pushing the GLC 63 S Coupe, the damping lets the car down, and it starts to bounce around on its air springs.” Even in its firmest mode, the AMG’s suspension never proved to be stiff enough to deliver the high-gain experience that the rest of the GLC package was promising. Exhausted after a long day on Angeles Crest, we fueled up and cannonballed to Las Vegas. Little green men were waiting. Ride and handling get a well-deserved portion of the attention during Best Driver’s Car. But as you well know, it’s only half of the formula that makes a driver’s car just that. It’s the atom without the neutron, if you will. Our next stomping ground: a blazing-hot scenic drive along some of America’s most top-secret sites on the deserted Extraterrestrial Highway, skirting Area 51, across the barren U.S. Route 6, and then a straight shot down US-95, hugging the edges of the nuclear-weapons Nevada Test Site to reach our end point in Death Valley. Leaving Vegas by car is always a gamble, one I won by scoring the keys to the Alfa. 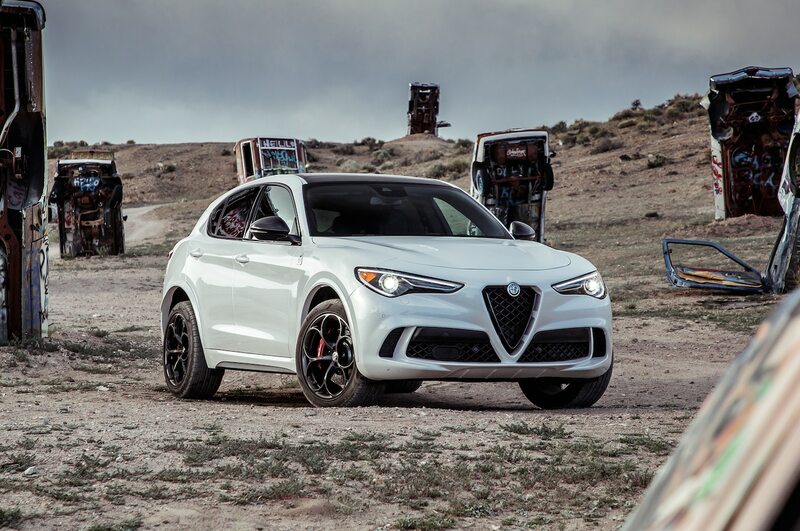 For a knife-fighter, the Stelvio is remarkably comfortable on the highway. 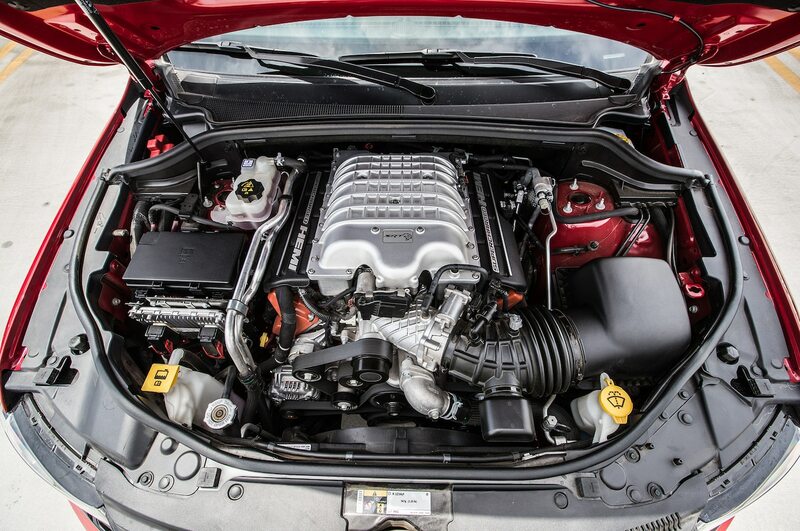 Its high-strung V-6 is brutally powerful; it’s laggy off the line, but once the turbos spool up, it sends out wave after wave of torque. 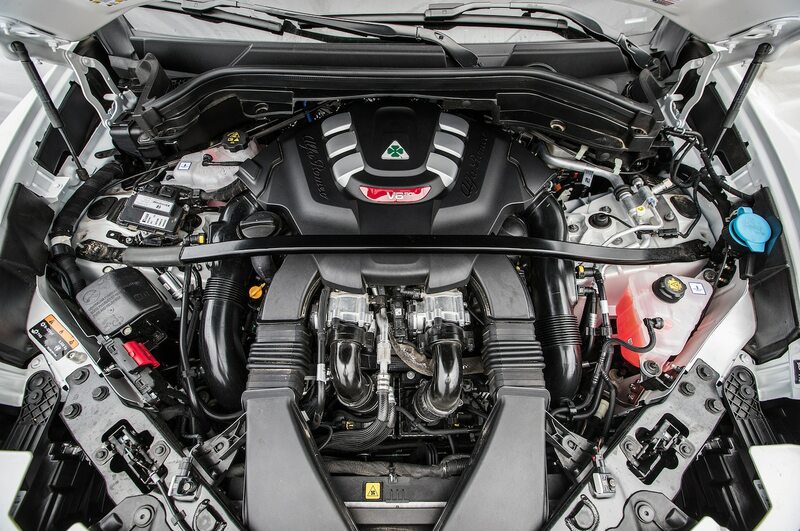 “The engine is powerful and the transmission doesn’t need your guidance; it’s fine on its own,” said Scott. The test data shows he’s right. 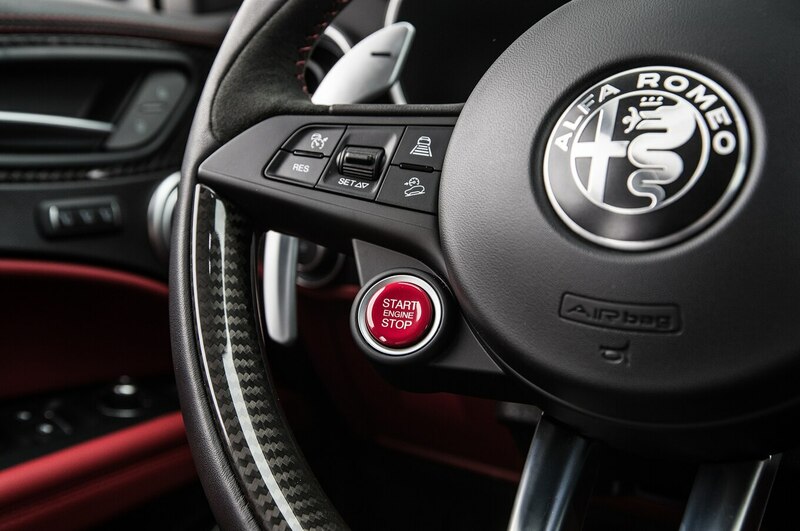 The Alfa accelerates from 0 to 60 mph in 3.5 seconds, and it’ll run the quarter mile in 12 seconds flat at 114.4 mph (184.1 km/h). Yet these startling numbers are only midpack in this group. 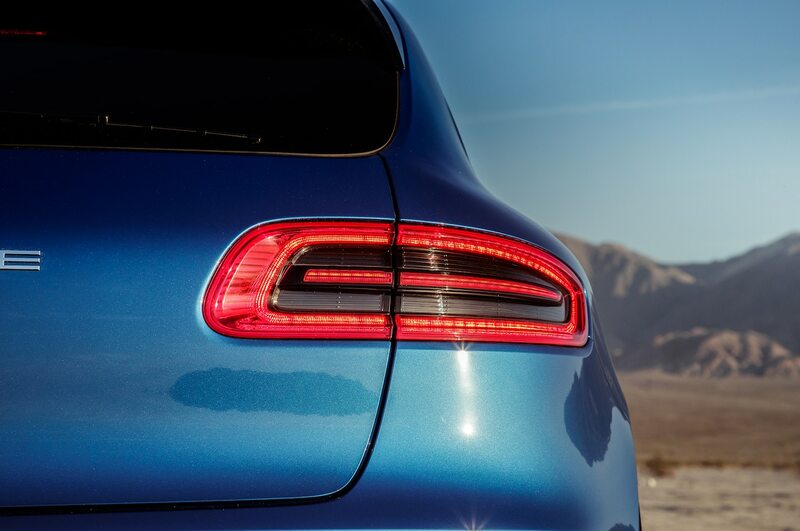 The Macan futilely attempts to hang on the Alfa’s tail. 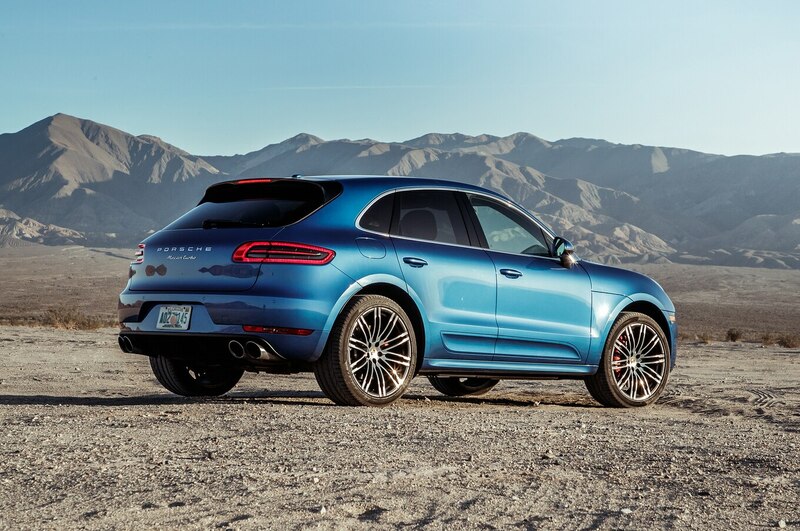 Hustling through the San Gabriel Mountains the day before, the Macan felt quick. 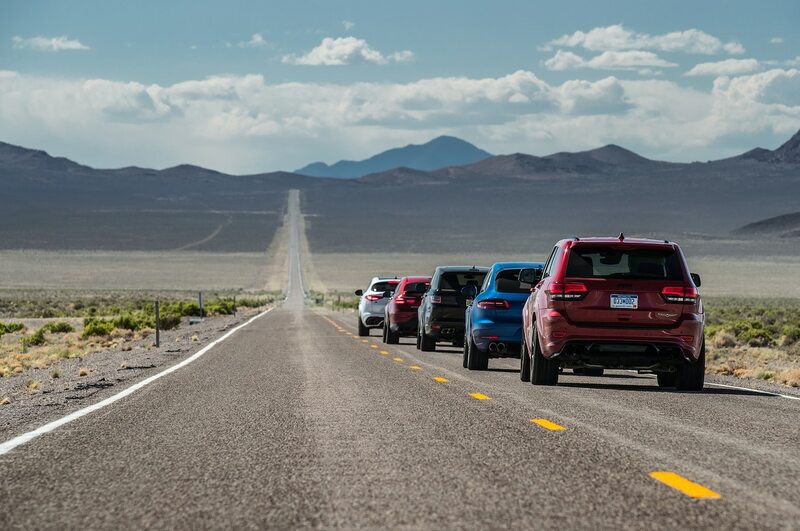 But out on the endless straights of Nevada highway, its power disadvantage becomes apparent. 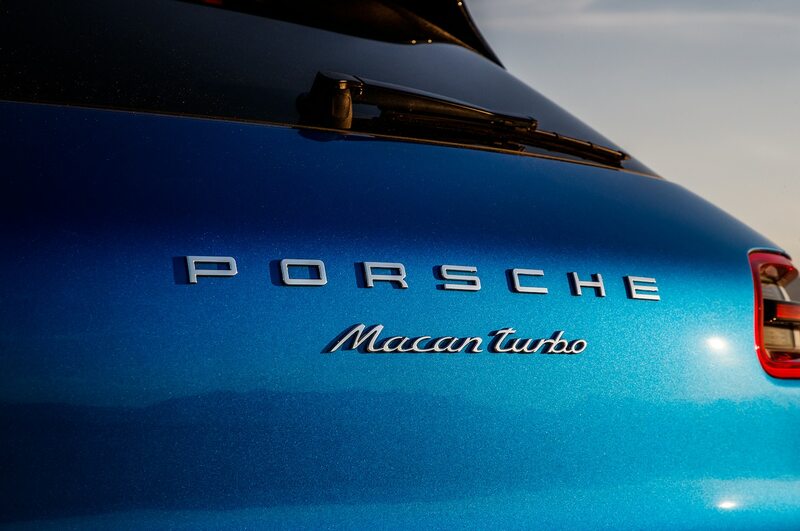 It’s kind of amazing how much horsepower can skew things; the Macan’s 440 ponies are enough to get it from 0 to 60 mph in a properly quick 3.8 seconds and through the quarter mile in 12.5 seconds at 109.4 mph (176 km/h). But in this group that still makes it second slowest. The Range Rover Sport SVR brought up the rear of our strike package—not that those driving it minded. Arguably the most comfortable long-haul cruiser of the bunch, the Rover had another trick up its sleeve. 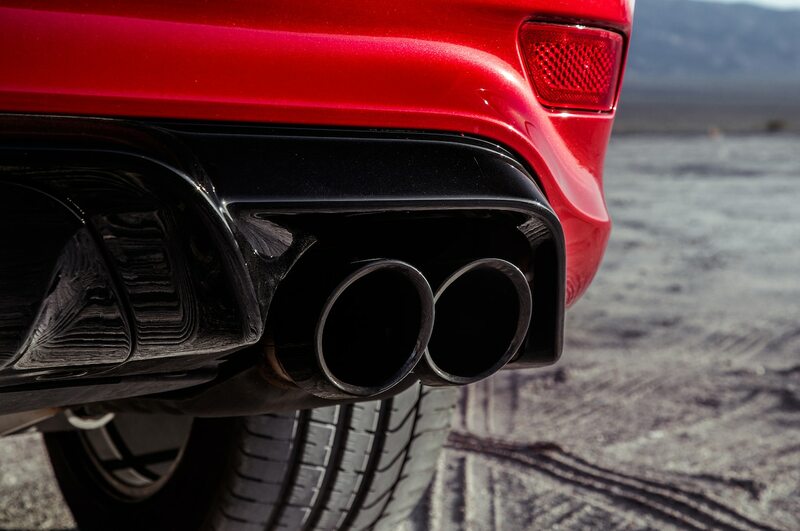 “The award for best exhausts goes to the Range Rover Sport SVR,” Erick said. “But it sounds much quicker than it feels behind the wheel.” He’s right. In nearly all of our instrumented tests, the SVR trailed this pack. 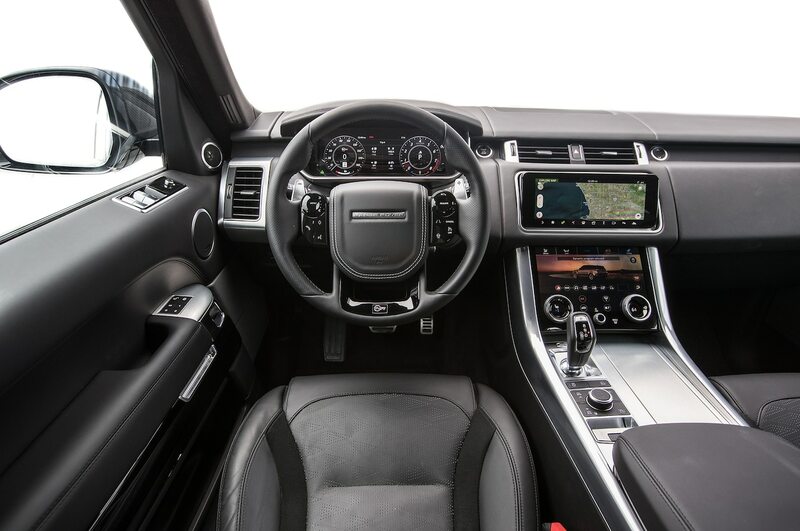 It takes the Range Rover Sport 4.3 seconds to accelerate from 0 to 60 mph, and it needs 12.7 seconds to cross the quarter mile at 110.9 mph (178.5 km/h). That’s hardly slow, but it ain’t setting speed records in this crowd. 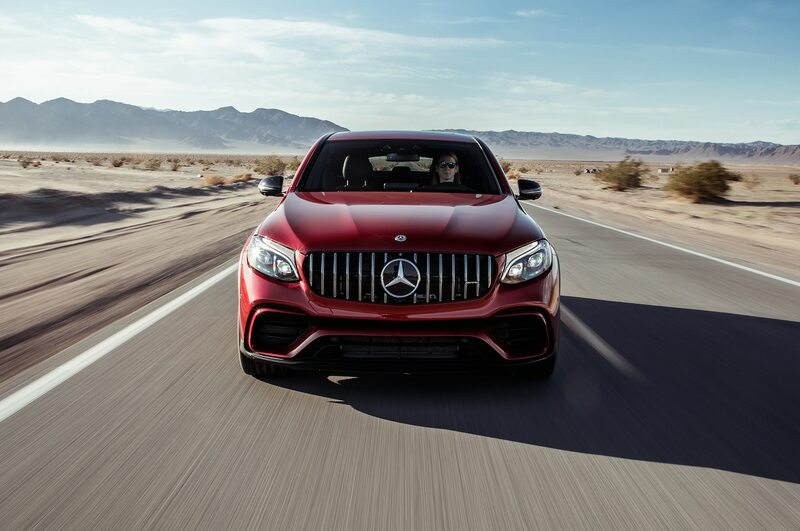 The better-balanced Mercedes doesn’t need any more than the 503 horses under its hood thanks to its nearly 1,000-pound (454-kg) weight advantage. “The AMG’s ‘big’ V-8 puts out all the cruel and lovely snarls we’re used to, deep and throaty and pretty much hinged,” Jonny said. 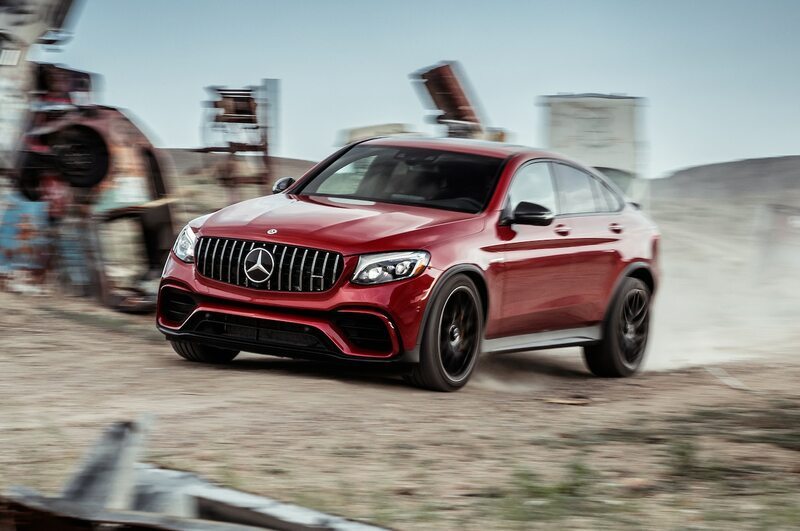 “It feels both torquey and fast.” The GLC 63 S loves eating up highway miles at extralegal speeds just as much as it does launching hard for drag races. 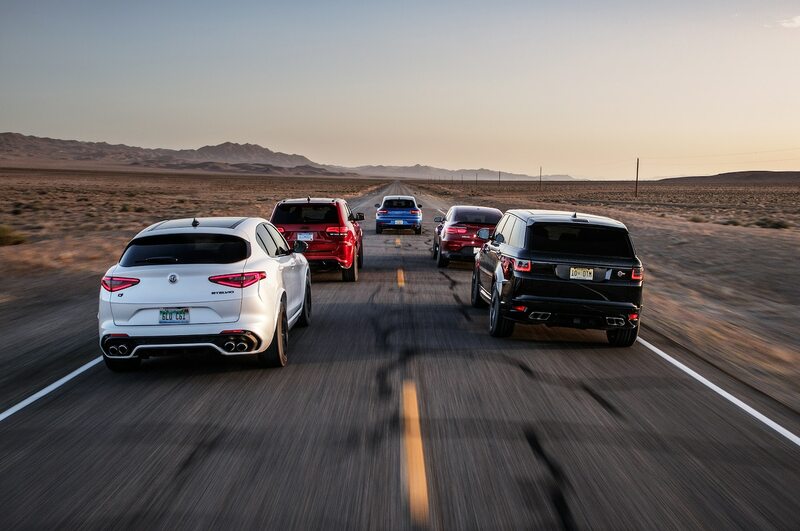 In instrumented testing, the GLC 63 S and Grand Cherokee Trackhawk are constantly trading blows. 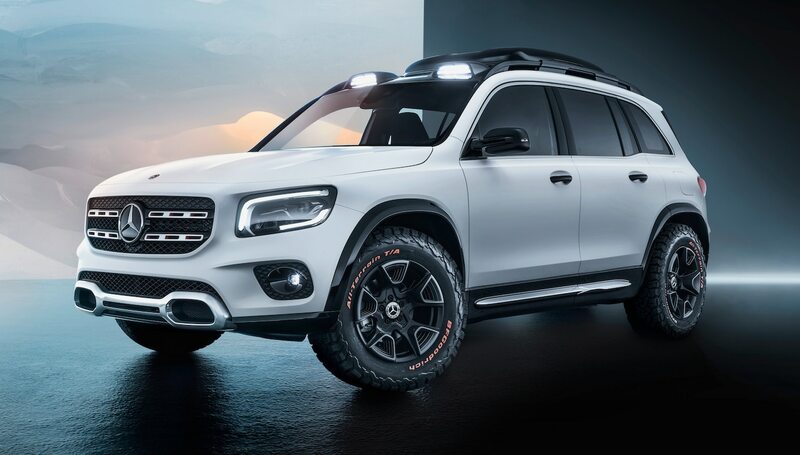 The German and American tie each other from 0 to 30 mph (48 km/h), the Jeep edges the Mercedes to 40 mph (64 km/h), the Mercedes comes even at 50 mph (80 km/h), and then ultimately it takes the 0–60 crown. The GLC’s 3.2-second 0–60 run ties the Tesla Model X P90D for the quickest SUV we’ve ever tested. 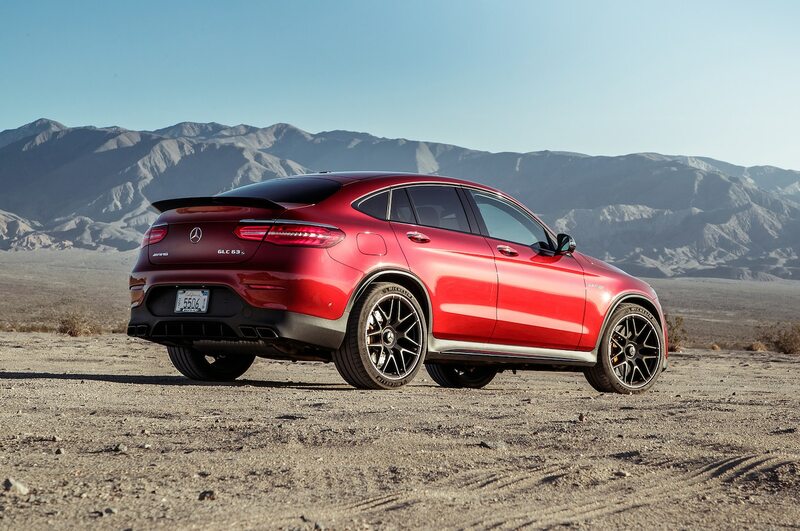 The Merc is also the quickest gas-powered SUV we’ve ever run down the quarter mile—tying the Jeep’s 11.7-second quarter-mile time but at a higher 116.5-mph (187.5-km/h) trap speed. It’s close enough to call it a draw. Even in the open desert, local police presence means this fight won’t be settled today. I think it’s fair to say that everyone hated my logistical planning skills after our loop through Nevada to Death Valley. 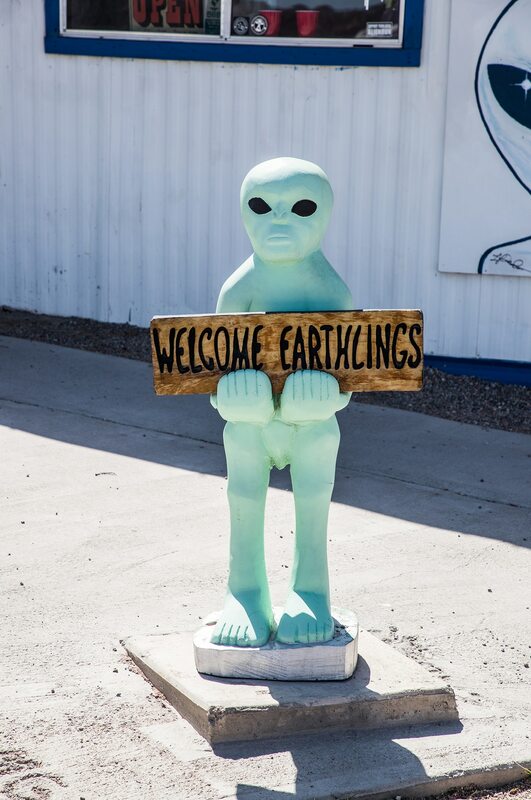 After a long day, the only alien we saw was the plaster one standing outside of the Alien Research Center in Hiko, Nevada. 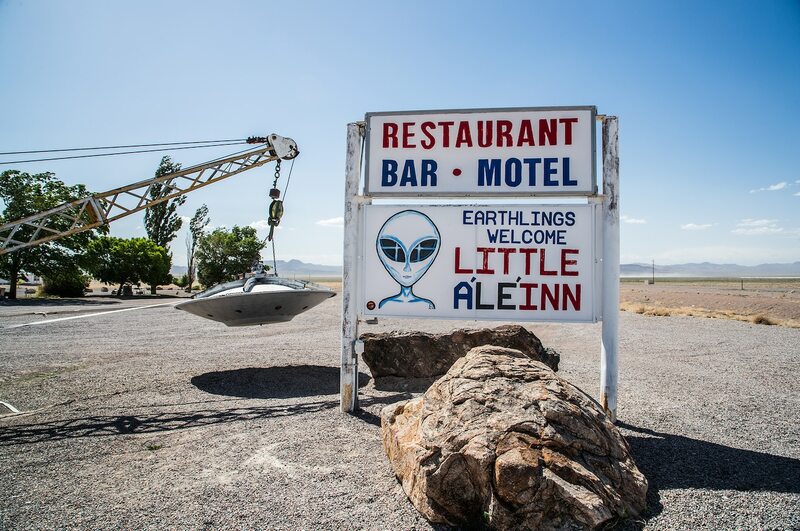 The only flying saucer we saw was hanging from a battered tow truck outside the Little A’Le’Inn in Rachel, Nevada. As for under-the-radar military stuff, we did see an old Nike nuclear-tipped missile serving as a gate guard for the secretive Tonopah Test Range, and a ’50s-era French fighter jet—likely belonging to the Air Force test pilot school—buzzed us. I’m sure those were secret at one point or another. But despite the hassle, there was a reason we wound up in Death Valley. 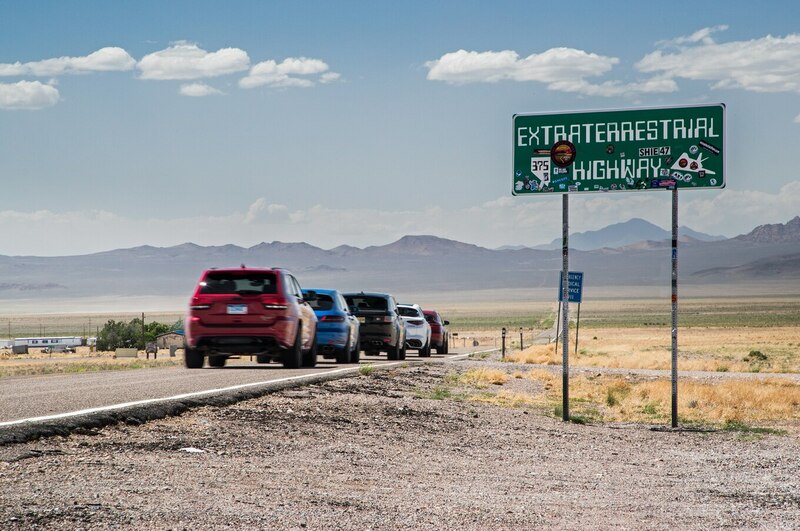 While the military develops its latest black projects in Area 51, not far away in Death Valley, the auto industry tests its own top-secret stuff. Bugatti Chirons and Ford GTs were both partially developed in the national park. Hell, we even bumped into Acura engineers hard at work on a to-be-announced performance MDX variant. 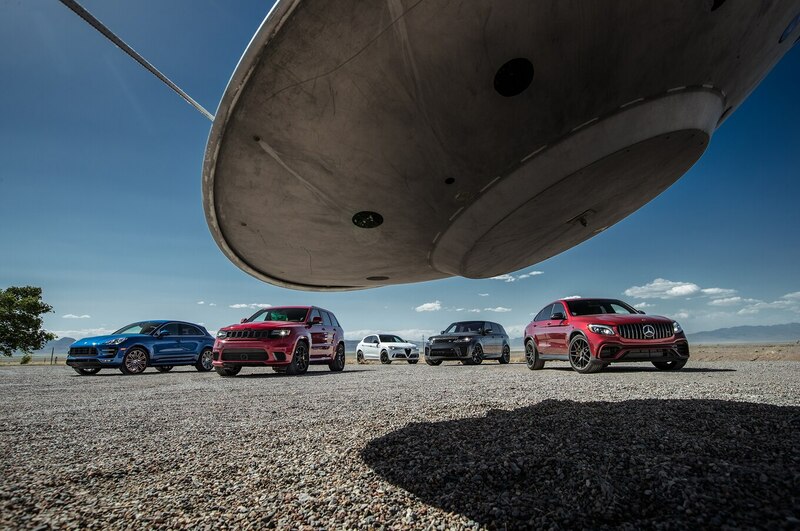 It’s a fair bet that each of our five super SUVs spent some development time in Death Valley, their test drivers, decked in bulbous helmets and the loose skin of racing suits, taking on a vaguely alien appearance as automotive engineers prod them for thoughts on how to push the performance envelop just a little bit past what we previously imagined possible. 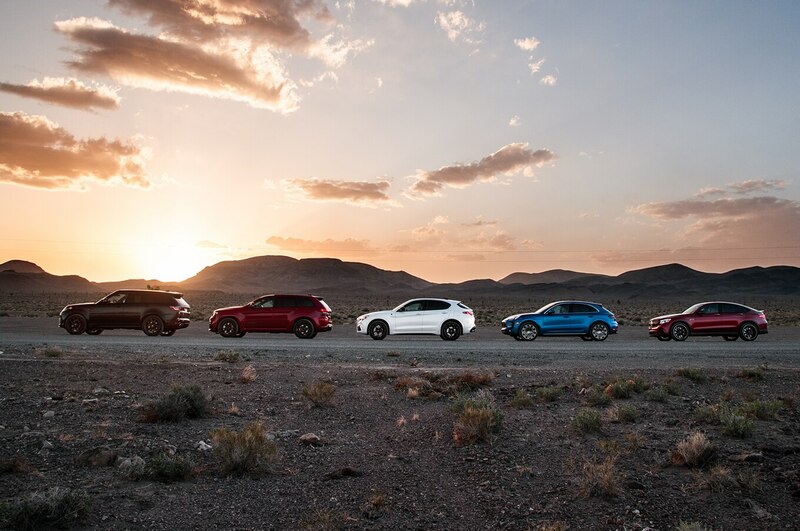 That evening, with beers to quench the desert’s heat, our SUVs ticking in the cool desert night behind us, it was time to take all we’d learned and pick the SUV that most deserved a shot at Best Driver’s Car. 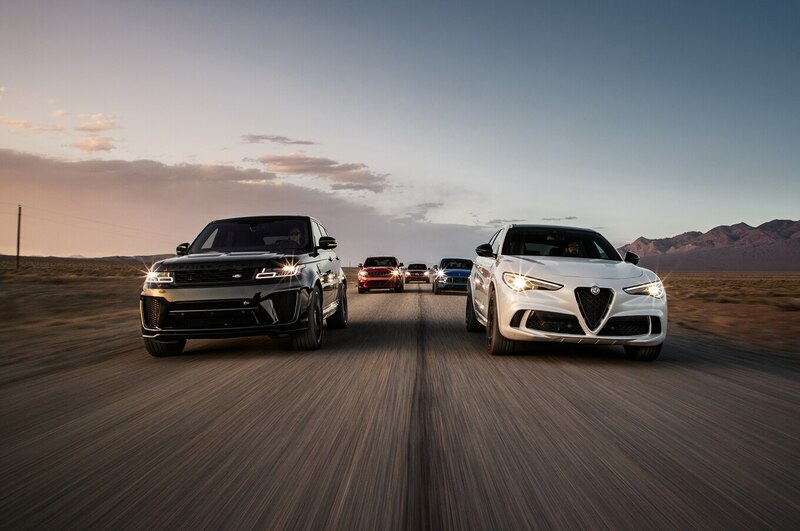 After all—only the best-driving SUV stands a shot at knocking BDC’s purebred sports and supercars off their pedestal. 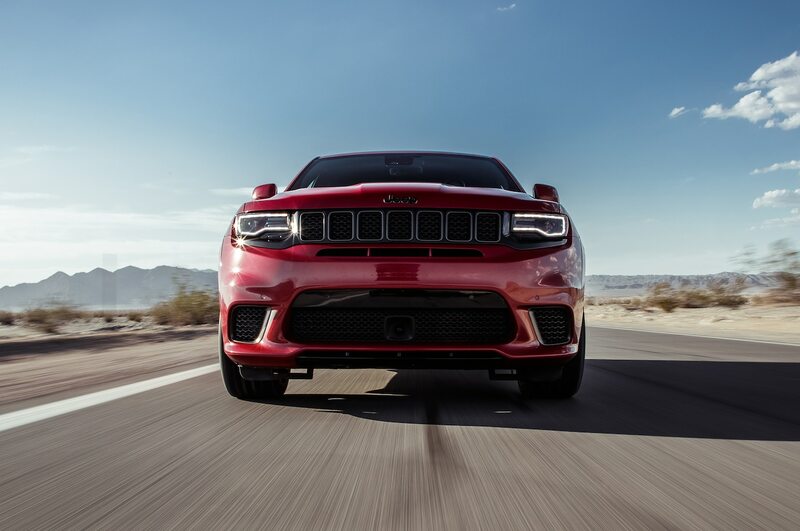 Were Best Driver’s Car singularly focused on straight-line speed, the 2018 Jeep Grand Cherokee Trackhawk would’ve been a sure bet. 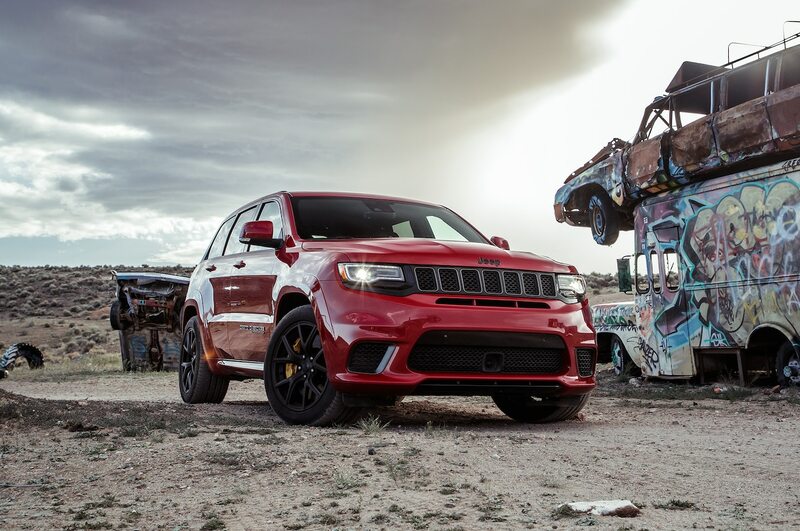 It’s stupid fun to bury the Trackhawk’s throttle in a straight line, but it’s severely underbraked for an object as fast and heavy as it is, and its handling performance is perhaps most kindly described as “sharp as a hammer.” Last place in this group is nothing to hang your head about, but this bruiser would be outgunned at Best Driver’s Car. 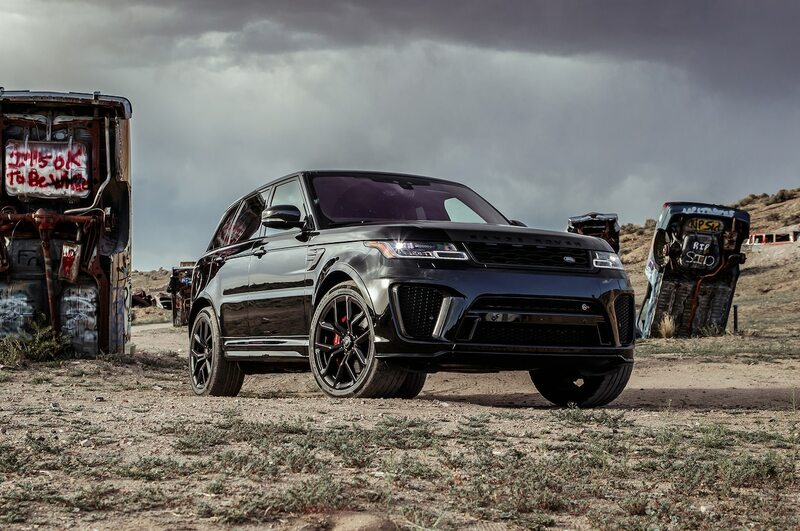 The 2018 Land Rover Range Rover Sport SVR finished ahead of the Jeep by a nose. Despite the Rover being the slowest SUV in this comparison, this isn’t a numbers game. Simply put, out on the road, the Range Rover Sport is more enjoyable to hustle through a corner or two, making the most of its power. 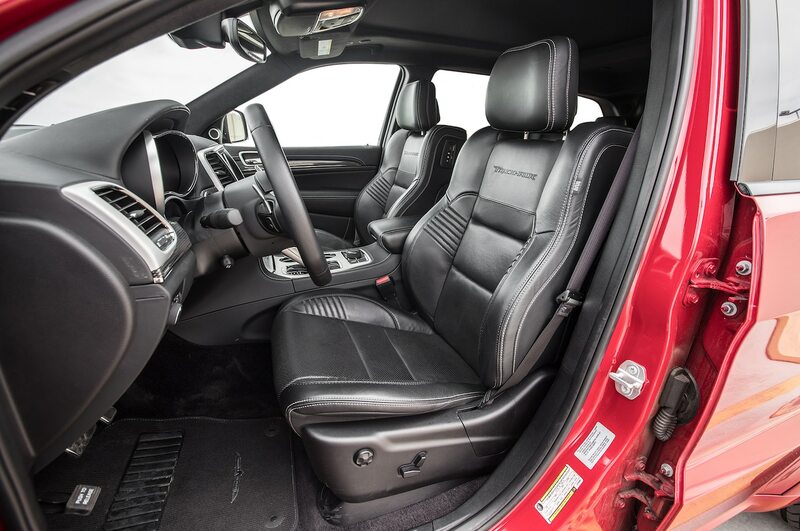 Although price wasn’t a factor in this comparison, it’s worth mentioning that the SVR, especially its interior, felt worth every bit of its $28,500 USD premium over the next-cheapest SUV here. 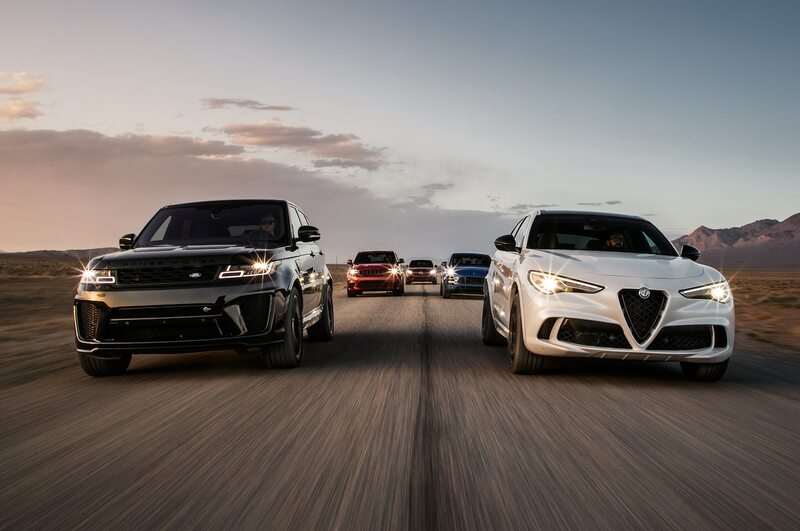 Ultimately it’s a game of inches, and with Best Driver’s Car rules in place, the Alfa Romeo Stelvio Quadrifoglio earns the win. 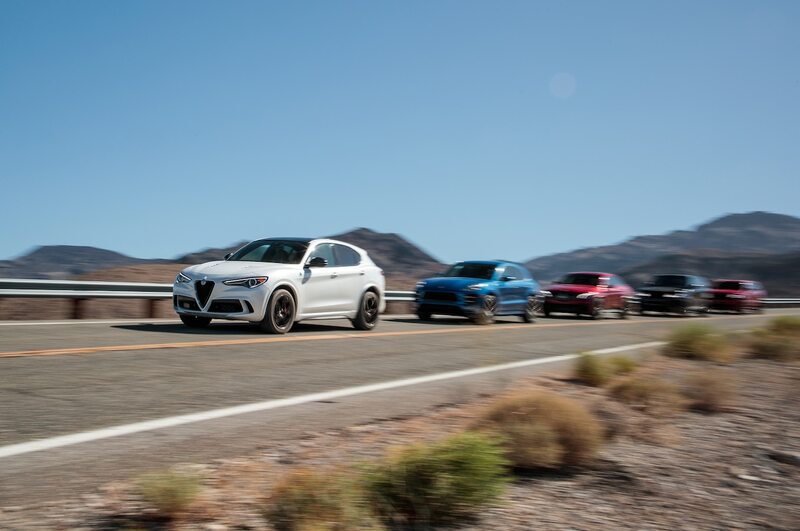 The Merc is quicker, but the Alfa is the most fun SUV here to drive, and in spite of its SUV-ness, it’s also one of the most outstanding vehicles on the road—regardless of shape, size, or curb weight. 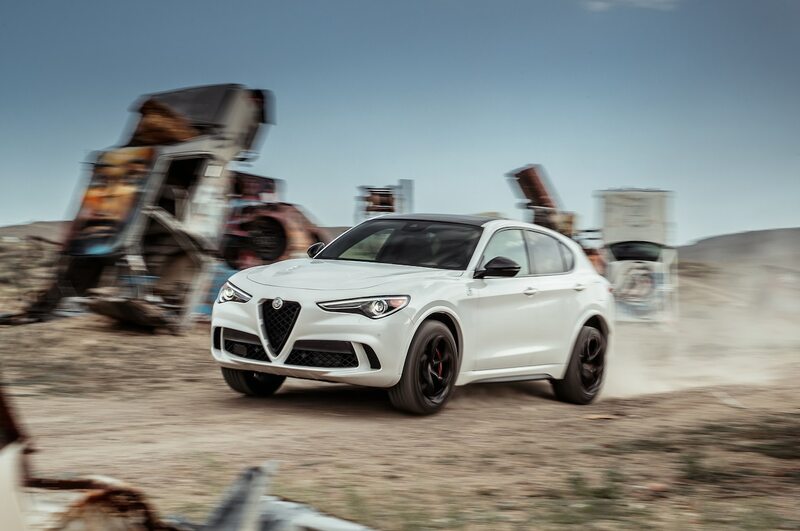 Like the secret projects being built in the middle of the Nevada desert, automotive enthusiasts might not like what the Stelvio Quadrifoglio represents. 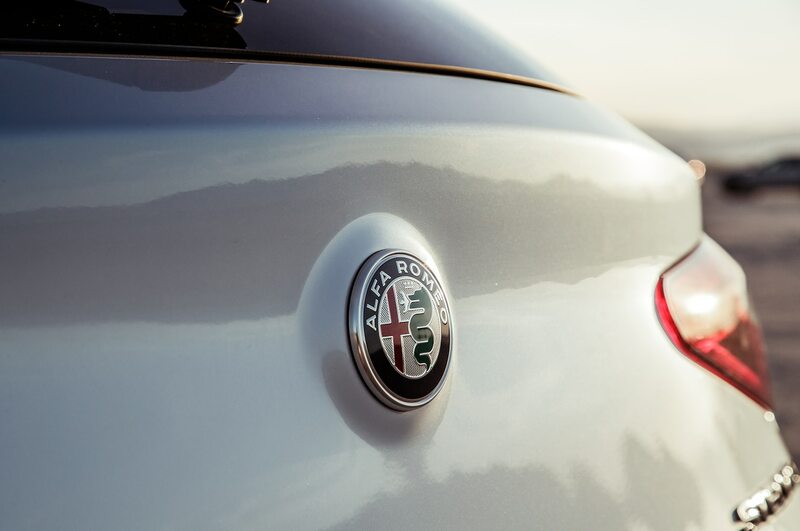 But there’s no denying that Alfa accomplished its mission of building a driver’s SUV. Best Driver’s Car contenders, you have your work cut out for you. Godspeed. The world’s fastest studio apartment is great in a straight line but leaves us wanting in corners. 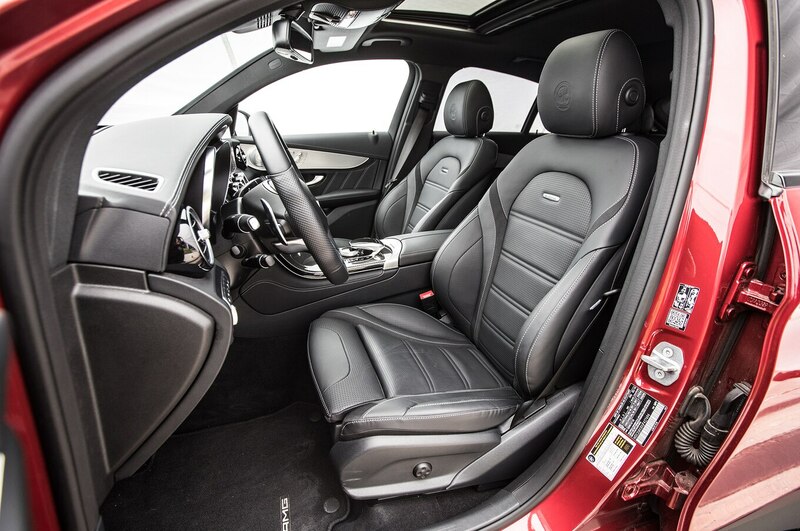 It’s guaranteed to score you a primo valet spot, if not necessarily a spot on the podium. 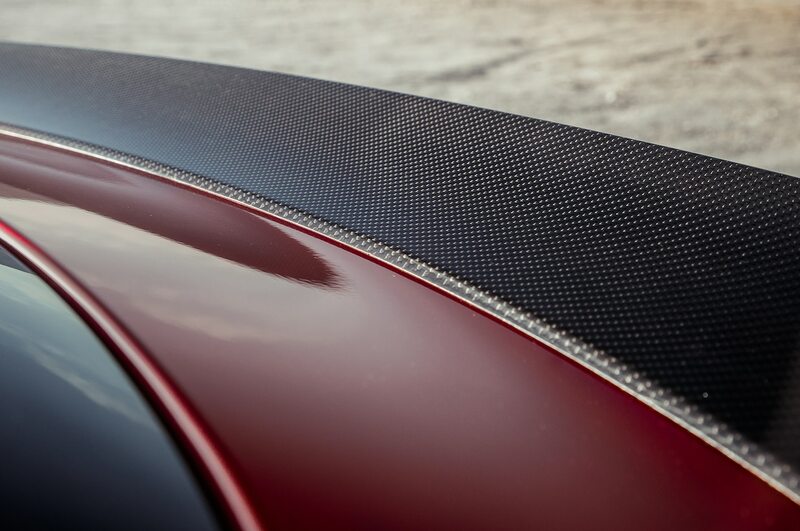 The soul we’ve come to expect from Porsche products is nowhere to be found. 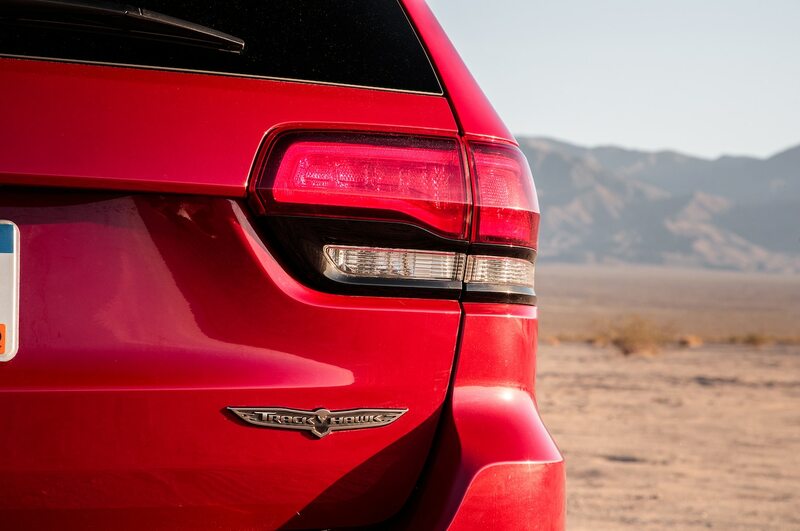 Say hello to the quickest SUV we’ve ever tested. Sort out its body control, and we might have had a different winner. Take everything you thought you knew about lumbering SUVs and throw it out the window. Blistering performance and sublime handling in an attractive, practical package. Bring on Best Driver’s Car.